So THIS is new. It may be a little out there for some of you. I can just feel my sister rolling her eyes now. But whether you believe or not, you've got to admit Tarot cards are fun. Let me start out by saying that I am a very open minded individual. I like believing in all sorts of things. You don't necessarily need to see something to believe it. I don't put 100% trust and faith in these cards and think they know everything about my life and my future. But I also don't not think that too, ya know? If you're confused, you're not alone. I don't know what to believe, but I thought "Hey, lots of people use these every day. Some swear by their power. Why not give it a try?". And so I began a one month journey into exploring Tarot cards, and seeing for myself if anything comes of it. Nothing to lose, and it's pretty fun to do. I started this experiment when I had the urge to go to The Rock Store. Now, I had never been there before, but my friend Jaimie says it is her favourite shop like that. They sell crystals, and spiritual books, and many, many oracle card decks. I don't know why, but I just felt like I needed to go. I happened to be in the neighbourhood visiting a client one afternoon, so I popped in. I ended up purchasing a moonstone and a deck of Tarot cards. Each day for the next month, every morning, I would cut the deck three times while putting my intentions into them, asking what the cards needed to show me that day, and draw the top card. I just wanted to see if the descriptions of the cards would have any significant meaning, if they would predict anything, or make me feel a certain way. I woke up the next morning so excited to start my experiment. And so began this month long experience. I find it SUPER interesting that there were multiple cards that I pulled twice. There were 78 cards to pick from, my experiment lasted 31 days. I never took stats or anything in high school, and I don't know what the odds were of pulling cards multiple times, but this was pretty neat for me. It made me really happy when on the last day, I pulled the same card as the first day. Call it coincidence, or call it fate. But the 10 of Cups has my back, guys. I used Biddy Tarot as a reference to learn about each card as I pulled them. A very helpful site! The suit of cups kept coming up a lot for me. According to Biddy Tarot, the suit of cups represents the element of water. "The Suit of Cups Tarot card meanings deal with the emotional level of consciousness and are associated with love, feelings, relationships and connections. Cups are about displays of emotion, expression of feelings and the role of emotions in relation to others. The Cups Tarot cards indicate that you are thinking with your heart rather than your head, and thus reflect your spontaneous responses and your habitual reactions to situations. Cups are also linked to creativity, romanticism, fantasy and imagination." "The people represented by the Suit of Cups (i.e. typically the Court Cards) are emotional, artistic, humane and creative. They are connected with their emotional selves and will draw energy from what they feel within. They are said to correspond to the water signs in the zodiac (Pisces, Cancer, Scorpio) and to water as a symbol of the subconscious mind and reason." I'm not a water sign (I'm a Virgo, earth sign), but have always had a deep affinity for water. I can definitely relate to being an 'emotional, artistic, humane, and creative' person who thinks with her heart. I had a very lovely start to this experiment by pulling what is now one of my favourite cards, the '10 of Cups'. Happiness, love, abundance, family. What's better?! Starting out on the right foot for sure. As the days went on, and I learned more about each card for that day, I started realizing something. The cards don't have to mean a literal event and that it's going to predict something right down to the T.
For instance, the day I pulled the '5 of Pentacles' I didn't lose any money, or feel any more worried about anything than usual. I feel like perhaps that card was just saying 'be aware'. And I think that's what all the cards mean for everyone. It forces you to think and feel deeper, to look at the bigger picture. If you pull 'Death', it doesn't mean that you're going to die that day, just like if you pull 'The Lovers' you probably won't randomly get engaged that day. It just makes you take a closer look at what's happening in and around yourself. How are you feeling, what can you do to make something happen, what opportunities are out there? Rather than just existing on autopilot. I believe that is my main take away from this experiment. And that Tarot cards are just fun! There are sooo many beautiful Tarot decks out there. This is the one I use! After completing this little journey I made for myself, I'm intrigued to keep up with it. Maybe not every single day, I don't think that's necessary. But pulling cards is something that I now really enjoy! I am also very interested in different types oracle & goddess decks. Decks with positive affirmations, and just more ways to help you think, and get, deeper. 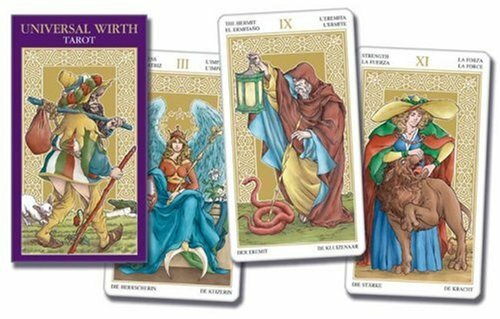 Do any of you have experience with the Tarot? Or any oracle cards? Let me know in the comments!